As I was cleaning out my computer (to move to a new computer), I came upon my ginormous photo stash. Yikes. When did it get so out-of-control?!!? And I remembered that in the old days, we went to the photo place and had our photos printed out. And we put them in a photo album. As in a physical, real live, photo album! (And some wise and creative peeps probably still do that!) But I simply had all recent trips on my computer. So, I chose the highlights of our fabulous trip to Thailand in 2014, and fit as many photo images onto one 8.5x11 photo stock and printed them out. Since I have an inkjet printer, I also sprayed them with a varnish to protect them as I did the project. 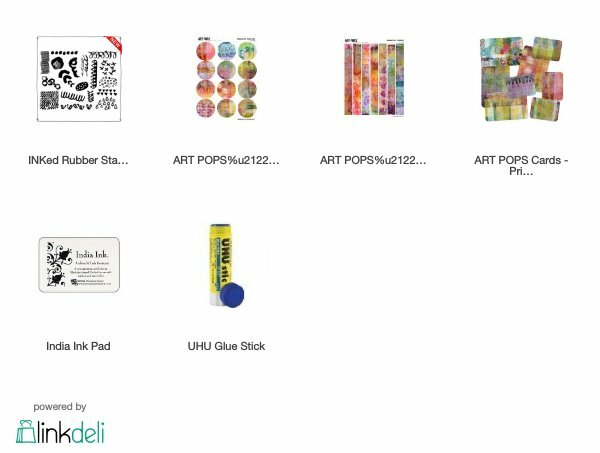 I laid them out and used Roben-Marie’s Art Pops™ and stamps to enhance the selection. And voila! Something I can trim out of my sketchbook and hang on the wall. A super fun remembrance of our trip to Thailand in 2014! have fun creating your own photo collage! Ha! Anything black! It might stem from my watercolor days when it was taboo in a “good” watercolor. Or it might be a little wishy-washy about deciding on darks. But it’s true! And that’s why I like stamps. I can stamp them on a sheet and decide which fun darks to add without pressure. I’d have to say my Dina Wakley Scribble Sticks. I carry them everywhere with my (smallish) sketchbook and can pull them and my water brush out to color. Anywhere. They’ve been a life-changer for my #the100dayproject as they are small enough to travel with.